Our eyes say a lot about us, and dark circles don’t convey the beauty and self-confidence we want to express. Shadowy, bluish black tint under your eyes is a result of blood vessels revealed by the skin. Lack of sleep is one of the main reasons for thinning of skin under the eyes. Proper sleep improves blood circulation which flushes out of broken blood vessels and reduces blood to pool under the eyes. Fortunately, there’s no need to waste time and money on commercial creams and lotions that are ineffective and laden with chemicals that can damage skin. You can minimize the appearance of dark circles using a natural, affordable, effective home remedies. That’s right, this common vegetable, which provides numerous health benefits when consumed, can also be used topically to improve skin health. If you cannot handle the astringent properties of cucumber, then you can choose fenugreek or green tea bags instead of it. 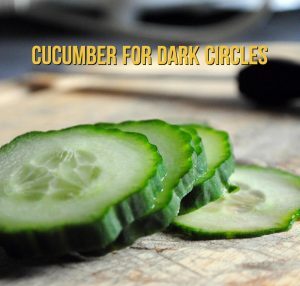 We’re about to tell you how to use cucumber, but first, we’ll tell you how cucumbers work to eliminate dark circles. Does Cucumber work for Dark Circles? Cucumbers are rich in vitamin C, which promotes the production of collagen, a protein that restores the skin’s elasticity, leaving it firm and supple. They also contain manganese and beta-carotene, which reduce inflammation and swelling. They contain flavonoid antioxidants such as quercetin, luteolin, kaempferol, and apigen, which tighten pores to prevent bacterial infections that lead to breakouts. They contain potassium, which reduces the appearance of fine lines. As a natural astringent, cucumbers lighten dark spots while tightening pores to make skin smoother. Cucumbers cool and soothe skin. Because they are 95% of water, cucumbers hydrate and moisturize skin. The anti-oxidants in cucumber slow down the aging process. Here is a detailed description of using cucumber with other natural ingredients that lighten skin and keep it healthy and young. Eat cucumbers as part of your regular healthy diet, and try all the methods below until you find the one that works best for you. Cut two 1/4-inch cucumber slices and place one over each eye. Remove and rinse with cool water. Repeat twice a day for at least a week. This method constricts blood vessels to reduce swelling. Juice a cucumber or puree it in a blender and strain to extract juice. Use cotton ball to apply juice to under-eye skin. This method tightens pores and lightens skin. For added benefit, include aloe vera juice. In a blender, mix cucumber with 1 cup water until smooth. Soak cotton pads in mixture, squeeze out excess liquid, seal them in a Ziploc bag, and refrigerate them. Once cool, apply to eyes and leave on for 15 minutes or until dry. Refrigerated pads can be stored up to 30 days. Refrigerate two spoons for 10 minutes. Peel and chop a cucumber and puree it in a blender. Use a cotton ball to apply cucumber juice to clean under-eye skin. Lie down and place one spoon over each eye, back side down. Leave on until no longer cool. Lemon juice naturally bleaches skin when used regularly over time. It also kills bacteria and removes toxins that damage skin. In a blender, mix cucumber with ¼ cup fresh lemon juice. Use a cotton ball to apply mixture to clean under-eye skin. Leave on 15 minutes then rinse with cool water and pat dry. Leftover mixture can be stored up to 3 days in the refrigerator. For added benefit, include lanolin cream. Sandalwood treats sunburn and helps maintain the skin’s elasticity. Mix equal parts cucumber puree and sandalwood powder. Use fingertips to apply mixture on clean under-eye skin. Potato contains natural bleaching agents that lighten skin when used regularly over time. Peel and chop a small potato, the puree it in a blender. Peel and chop one cucumber, then puree it in a blender. Mix potato juice with cucumber juice. Use cotton ball to apply on clean under-eye skin and leave on for 15 minutes. Store leftover mixture in refrigerator for up to 3 days. For added benefit, moisturize with almond or coconut oil following this treatment. Infuse two tea bags in 1 cup of boiled water. Grate and squeeze juice from cucumber and potato. Mix 1/2 cup of green tea water with the juices. Cut cotton pad into half and soak in the mixture. Squeeze out the excess and refrigerate for 15 minutes. Thaw the strips for 3 minutes and place them under the eyes. Wash your face with cold water after 20 minutes. Repeat this process 3 times a week for a month. Turmeric reduces inflammation and swelling to reduce puffiness. Peel and chop one cucumber and one potato. In a blender, mix potato, cucumber, 1 tablespoon fresh lemon juice, and 1/2 teaspoon turmeric. Use cotton ball to apply to clean under-eye skin and leave on 15 minutes. Mint cools and soothes skin, reducing puffiness. Crush a handful of fresh mint leaves to make paste. In a blender, mix peeled and chopped cucumber with crushed mint until smooth. Use cotton ball to apply on clean under-eye skin. For added benefit, include tomato puree. Use cotton ball to apply rosewater on clean under-eye skin. Let it dry then cover with cucumber slices. You can also mix cucumber juice with rosewater and apply this to under-eye skin for 10 minutes. Or, freeze the mixed juices and massage to under-eye skin with ice cubes. Peel and chop ½ a cucumber. In a blender, mix cucumber with 3 tablespoons organic raw honey until smooth. Apply mixture on clean under-eye skin and leave on for 20 minutes. Rinse with warm water followed by cold water, then pat dry. Store leftover mixture in refrigerator up to 3 days. Repeat process twice a day. Honey moisturizes, detoxifies, and nourishes skin. Mix 1 teaspoon each of honey and cucumber juice, and stir in ¼ teaspoon almond oil. Apply mixture to clean under-eye skin and leave on 15 minutes. Store leftover mixture in refrigerator up to 3 days and use twice a day. Mix ¼ teaspoon each of sea salt and organic raw honey. Coat two cucumber slices with this mixture and apply them to eyes. Remove and rinse with warm water followed by cool water. In a blender, mix ¼ cup cucumber juice, ¼ cup orange juice, and 3-5 mint leaves until smooth. Rest the mixture overnight to infuse. Drink daily, preferably in the morning before breakfast. The vitamin C in the orange juice will promote collagen production. Milk penetrates and nourishes under-eye skin to keep it firm and healthy. Apply one cucumber slice to each eye and leave on 15 minutes. Remove cucumbers and use cotton ball to apply milk to under-eye skin. Let dry, then rinse with cool water. The tannic acids in green apples lighten skin while vitamins B and C and potassium nourish it. Peel and chop one green apple, then boil it for 5 minutes. Puree boiled apple in blender. Peel and chop one cucumber and add to blender. Apply mixture on clean under-eye skin and leave on for 30 minutes. Use at least 3 times a week. Apple cider vinegar nourishes skin, restores its pH balance, and improves circulation to reduce puffiness and shadows. Mix 2 tablespoons apple cider vinegar with 2 tablespoons cucumber juice. Apply cucumber oil on clean under-eye skin and leave on. Combine with carrot seed oil or saffron for added benefit. Aloe-Vera repairs damaged skin while moisturizing and nourishing to slow the aging process. In a blender, puree ½ a cucumber. Add 3 tablespoons aloe vera gel or juice and blend again. Leave on 15 minutes, rinse with cool water, and pat dry. If you choose to purchase cleansers, creams, or lotions that contain cucumber, make sure you pick a natural brand that contains no harsh chemicals. Try BASQNYC Cucumber Tea Eye Gel, La Beauté Pure, Natural Concept Cucumber Gel, or RevitaLume Eye Cream. These brands can be found at some health and beauty stores and ordered online. For best results, follow the advice below when using cucumber to reduce the appearance of under-eye circles. Avoid applying makeup to under-eye skin. If you spend lots of time in front of computer screens, close your eyes for 60 seconds every 15 minutes or so. Always wash off makeup before bed. Avoid salt in order to reduce water retention. If dark circles do not go away, consult a doctor to find out if they indicate a more serious underlying health condition. These natural cucumber remedies take time to work. Use them for at least 2 weeks before deciding whether they are right for you. Have you tried using cucumber to reduce dark under-eye circles? Tell us which methods worked best for you!